There are eight legislative assembly constituency in Bijnor district for the 2017 Assembly elections. They are 17 Najibabad, 18 Nagina (SC) 19 Barhapur, 20 Dhampur, 21 Nehtaur(SC), 22 Bijnor, 23 Chandpur 24 Noorpur. When Uttar Pradesh assembly election 2017 is getting ready to electios new Assembly, Bijnor is not anywhere behind in the election heat. Bijnor (Hindi: बिजनौर ज़िला, Urdu: بجنور ضلع) is a district of Uttar Pradesh state of India. Bijnor city is the district headquarters. 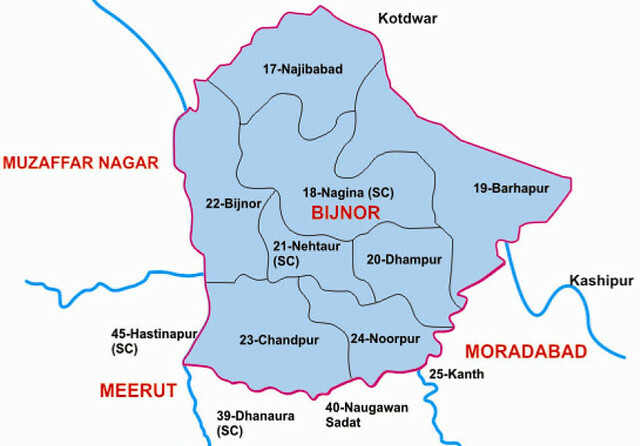 The Uttar Pradesh Government wants Bijnor to be included under National Capital Region (NCR) due to its close distance from Delhi,The demand for inclusion of Bijnor in the NCR has been raised.